If you're a fan of Nelson's Ship in a Bottle currently adorning Trafalgar Square's Fourth Plinth, then you can find out more about the artist and the artwork at a special National Maritime Museum weekend. On 26 and 27 February, the Greenwich-based museum will hold a series of events and debates and workshops in a nod to Yinka Shonibare's work. As well as a debate on Trade, empire and contemporary art featuring Shonibare himself, there's also a discussion about London's textile culture, screenings of the 1962 film HMS Defiance, and a chance to see the artist's original maquette. Best of all, there'll be a live action origami recreation of the battle of Trafalgar. There's something new to tell your workmates when the inevitable "How was your weekend?" query comes up. Yinka Shonibare MBE at the National Maritime Museum takes place on 26 and 27 February. For more information, go to www.nmm.ac.uk/shonibare where you can also download your own origami boat template. 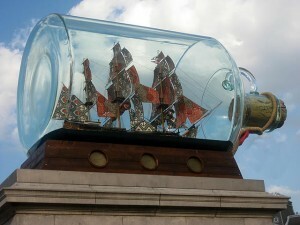 Photo of HMS Victory in a bottle in Trafalgar Square by Matt from London via the Londonist pool.